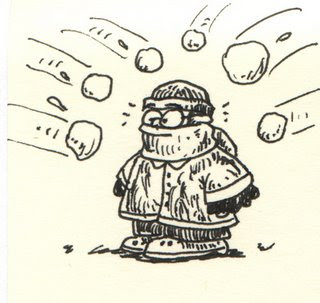 When I was in high school we were having a snowball fight (indoors) during gym class. One of my friends got me good right in the head so I leaned out the doors got some snow, went to run after her I hit a pole instead which stopped me in my tracks and chipping my front tooth. Thankfully the chip felt bigger than it was... No more snowball fights indoors, lesson learned. Hurry Call the Tooth Fairy! Then he just took my money!